Welcome to AmberLink, one stop shopping experience where you can learn to love amber. It is a natural, warm, and powerful stone of astonishing beauty. 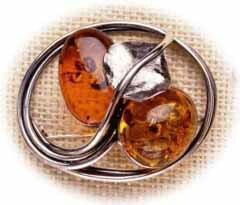 This beauty is enhanced in silver jewellery created by amber artisans, at prices you can afford. Please visit our E-Store. Jewellers, please visit us at our Polygon site. You are our 22,757 visitor. Graphics and HTML authoring by VisArt Studio. ©2007 AmberLink. All rights reserved.